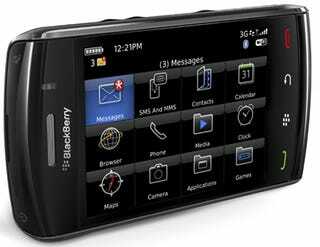 We weren't able to bring you guys a kickass, timely BlackBerry Storm 2 review like we wanted—and we're sorry about that. Check out a roundup of other reviews below; it's the least we can do. Reviews vary widely in verdict, just like the original Storm (CNET gives it two out of five stars, while PC Mag gives it four out of five) but on the whole everybody agrees that it's a definite step up, fixing most of the issues users had with the original (most notably that lag problem). Some of the reviews, particularly PC Mag and IntoMobile, are downright glowing, which is unexpected given the critical response to the original Storm, but certainly welcome. Note: The two British publications, TechRadar and Times UK, reviewed the 9520, which is the Vodafone version. All others reviewed the 9550 (the Verizon version we'll see in the States). CrackBerry: "The Storm2 fixes many of the BlackBerry Storm's outstanding issues and makes a ton of incremental improvements, all of which add up to something that feels noticeably better." CNET: "The RIM BlackBerry Storm 2 brings some welcome additions, such as Wi-Fi, updated software, and a better touch interface, but it's going to face some serious competition from Verizon's upcoming touch-screen smartphones." PC Mag: "The BlackBerry Storm2 9550 finally delivers on the original Storm 9530's promise." Washington Post: "Definitely an upgrade from the first Storm in design and usability"
Wall Street Journal: "Fixes all those [hardware] flaws [in the Storm]," but "the traditional BlackBerry interface cries out for a major overhaul"
Laptop Magazine: "It's really more like a do-over than a sequel." IntoMobile: "I might find something to nag about on the Storm2 after putting it through the gauntlet, but right now, I just really like this thing. All of the gaps have been plugged." TechRadar (9520): "Overall, the Storm 2 is very much an improvement over the original Storm, but it's evolutionary rather than revolutionary, despite overhauling the SurePress interface." Times UK (9520): "For all its attempts to court a new customer base, the core market for the Storm 2 remains the business user"